Q1. In the following question, select the odd word from the given alternatives. निम्नलिखित प्रश्न में, दिए गये विकल्पों में से विषम शब्द का चयन कीजिये. Sol. Foundation is the main part or the first thing after that rest are made. Q2. In the following question, select the odd letters from the given alternatives. निम्नलिखित प्रश्न में, दिए गये विकल्पों में से विषम वर्ण का चयन कीजिये. Sol. Pair of opposite letters except DU. BD, CE, DF, EG, ? Sol. ‘Liberal’ ; There is no double ‘l’ in the given word. 4 ÷ 16 × 5 + 4 – 2 = ? यदि “–” का अर्थ “से भाग “, “+” का अर्थ “से घटा “, “×” का अर्थ “जमा” और “÷” का अर्थ “से गुणा”, तो 4 ÷ 16 × 5 + 4 – 2 = ? Q10. In the following question, select the related word from the given alternatives. निम्नलिखित प्रश्न में, दिए गये विकल्पों में से सम्बन्धित शब्द का चयन कीजिये. Car : Road : : Rail : ? गाड़ी : सड़क :: रेल : ? Q11. In the following question, select the related letters from the given alternatives. निम्नलिखित प्रश्न में, दिए गये विकल्पों में से सम्बन्धित अक्षर का चयन कीजिये. UVWX : YYYY : : ABCD : ? Q12. In the following question, select the related number from the given alternatives. निम्नलिखित प्रश्न में, दिए गये विकल्पों में से सम्बन्धित संख्या का चयन कीजिये. 102 : 10404 : : 104 : ? Q13. From the given options, which answer figure can be formed by folding the figure given in the question? Q14. In the given figure, which number represents cold drink which is black and sweet? दिए गए चित्र में, कौन सा अंक ठंडा पेय का प्रतिनिधित्व करता है जो काला और मीठा है? Q15. 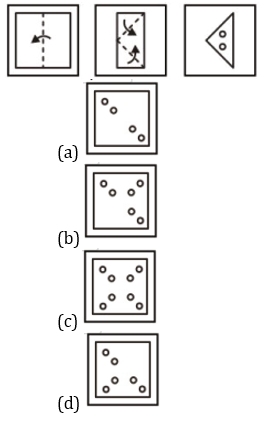 If a mirror is placed on the line AB, then which of the answer figures is the right image of the given figure?